There is far more to Local SEO in for Google places than just the ranking of your web site. The reality is, even if your site is in the first or second position for three of four keywords, you will still end up in the 3rd or 4th position for other relevant keywords. Take our Friends At Vivax Pro Painting. 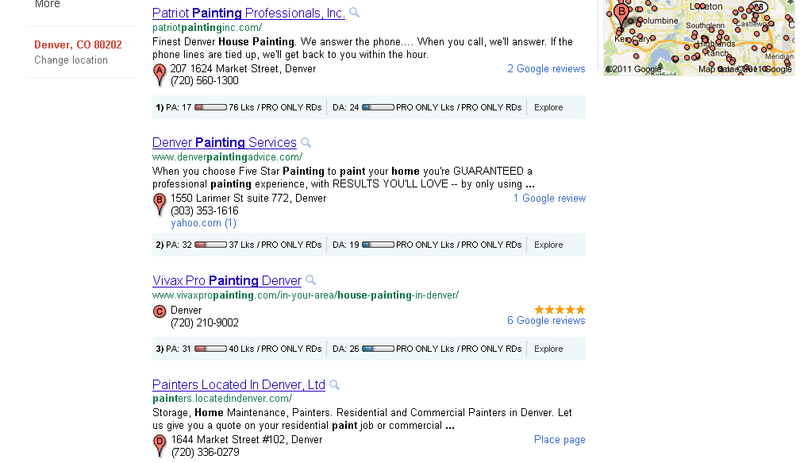 Their site is ranked in the first or second position for just about every search you can imagine related to house painting ______ < add a city around Denver. But for a few searches they fall to 4th or so. They still will get a high percentage of the clicks for one reason They have 6 reviews and therefore have the “Stars” on the SER places listing. This will draw people to click. If they had 2 reviews, or none, they wouldn’t stand out, and would lose about 75% of the possible clicks to their site because they are in the 4th position. The first three listings will get about 85% of clicks in a all things being equal situation. But by providing the searches with something that clearly makes your listing stand out, you can pick up a larger share of clicks, and therefore customers. LOCAL SEO’s who focus only on rankings are not doing the best job they can… and their clients may be losing out on revenue. That’s way we provide a turn key system to clients to get their customers to go to and review their services on Google and other important sites. It’s not SEO, it’s PR and conversion tactics.